The plight of a professional athlete can be polarizing. While some might be showered with gifts, fame and a well padded wallet, others might be struggling to put food on their tables while they sacrifice their bodies week in and week out. Of course, this is the true nature of sports, but when it comes to soccer, there are so often those who reach great heights, stumble and rise once again to find their place. 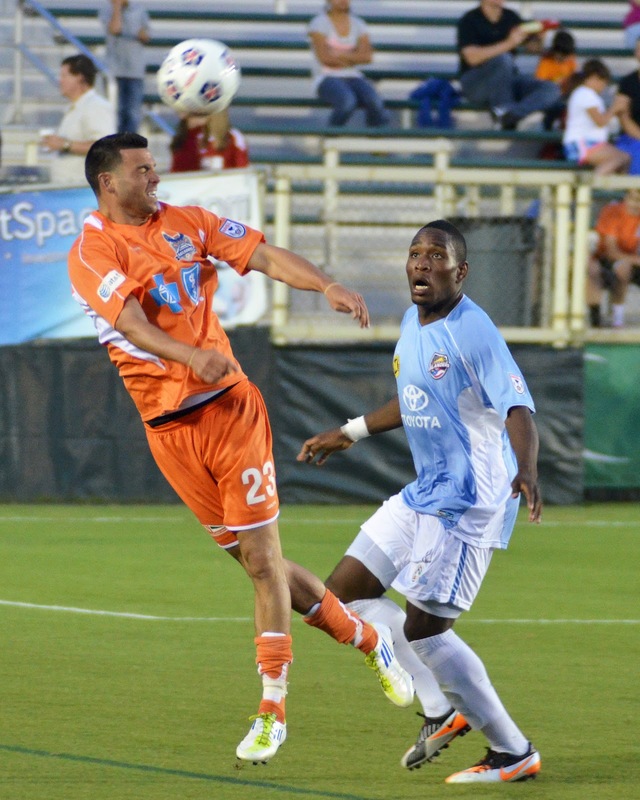 In the case of Nick Zimmerman, who is currently plying his trade for the playoff bound Carolina RailHawks, adversity is nothing new. Nor is it something to be ignored. Zimmerman has twice been on the roster of a Major League Soccer team, only to face the challenges that come with playing in North America’s top flight. But it is what he has done since leaving those rosters that stands out most. A fifteen goal season, Team MVP and being a key figure for a team that has bounced back from a remarkably troubling start to the season all serve as evidence of Nick Zimmerman's overcoming of past trials. To meet Nick Zimmerman is nothing short of humbling. The six-foot tall midfielder is often displaying one of two demeanors: one of stern focus, driven by passion for his craft. The other is also driven by passion for his craft, but often seems jovial. A smile can often be seen on Zimmerman’s face no matter the circumstance on the field, so long as he is wearing cleats and moving a ball at his feet. That passion has lead Zimmerman through many locker rooms and taught him to find joy in his craft no matter the challenges that come with it. Born in Rhode Island, the Zimmerman family moved to Tampa Bay, Florida for his fathers job when he was only beginning his adolescence. Two years of ODP (Olympic Developmental Program) in Rhode Island prepared him for high levels of the sport at a young age. Moving to Florida and proving himself all over again provided the first major hurtle of his young career. A hurtle that Zimmerman surpassed beautifully by playing for various high level clubs in Florida, including traveling to Miami. As many young players with talent often do, Nick battled against older players and took their starting positions. Playing up was both difficult and necessary to his development. Practices further away, later in to the evening and trips that might cost more were a sacrifice that stressed his family. That was a sacrifice the Zimmerman parents, Jeannine and Jerry, made after seeing their son’s potential. Perhaps most importantly, the sacrifices made by his parents are not lost on Nick. Those heroes certainly have made an impact. His parents and sister are a clear source of inspiration. Multiple times throughout the interview Nick reflected on his appreciation for his parents traveling to support him. Sometimes those trips took them from Florida all the way to Philadelphia or even New York. 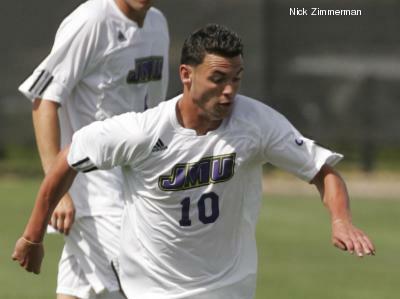 At one point during his youth career, Zimmerman’s drive lead him to play and train with the U-15 National Team. Playing amongst names like Freddy Adu, Giuseppe Rossie and Danny Szetela. All names who, at the time, were being lauded as the second coming of American excellence in soccer. Fighting for playing time with that squad was both exciting and humbling for Nick who maintained his passion for the game throughout. Those battle for time in youth training developed Zimmerman into a versatile player, one whom James Madison University identified as a must have. Zimmerman attended and played for JMU from 2005-2008, being named All-CAA first team as well as leading his team in points, goals, assists and game winners. 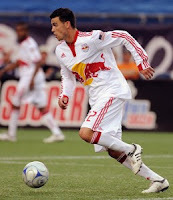 After such a successful college career, one which surprised many and perhaps turned heads, Zimmerman was invited to the MLS Combine, being selected by the then-rebuilding New York Red Bulls in the 2009 MLS SuperDraft. Things with New York did not go as planned for Zimmerman. Just over ten appearances and light on minutes, the Red Bulls loaned him to Crystal Palace Baltimore. Both experiences are valued by Zimmerman and yet another obstacle he was forced to overcome. Zimmerman’s hard work did pay off, though the success may not have been immediate. Selected by the Philadelphia Union in the 2009 Expansion Draft, his time there was short as he again found himself on loan. This time he was sent to the Harrisburg City Islanders. In talking with Zimmerman, it’s clear how he appreciates the time he was given on the field, regardless of team. Also evident was the drive to improve, regardless of setback. That determination, the perseverance to prove himself at a high level allowed him to land in Carolina. 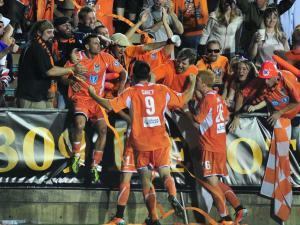 The RailHawks are a club that has quietly established itself as a team which develops players to the next level. It is that attitude of development, combined with a drive to improve and have best on and off field experience the franchise can provide which might be the key formula for Zimmerman’s recent renaissance. On not playing, Nick’s candid nature is obvious. “It’s easy to say the right thing, that it didn’t bother me, but of course it did. I wanted to play. I want to play. You believe in yourself and you believe you deserve a chance and I know now that I’m stronger because of it. 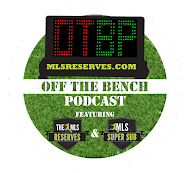 Always talented and acknowledged, the setbacks of loan stints and what some might call a failed trial with Major League Soccer, those outside of the game may frown on the name. But to those watching him week in and week out, or those who have played with or against him, they know the talent he possesses. 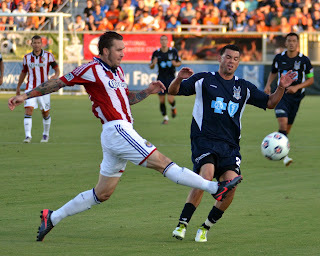 That talent is what has lead to Nick Zimmerman being selected as the 2012 Carolina RailHawks Team MVP, the team’s highest honor. Not only was he the team’s most valuable player through 2012, but his 15 goals and one assist in league play marked the best season of his professional career by far. During 2012, his 26 starts in 26 games, 2,295 minutes played only serve to demonstrate his importance to the club. 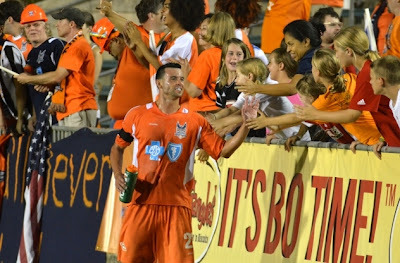 When healthy, when able, Zimmerman helped take the RailHawks to a fourth place finish and playoff bound. No small feat to a team which started the season in less than ideal standing. Head Coach Colin Clarke had no qualms acknowledging the value and effort that Zimmerman has put in this season. When he first arrived in Carolina, it was in 2011. Zimmerman was in need of a team and Carolina in need of talent. They’d already lost several players to Major League Soccer, including Daniel Paladini of the Chicago Fire. Paladini’s deft touch on the ball was missed. It was Nick Zimmerman who helped to fill that void. 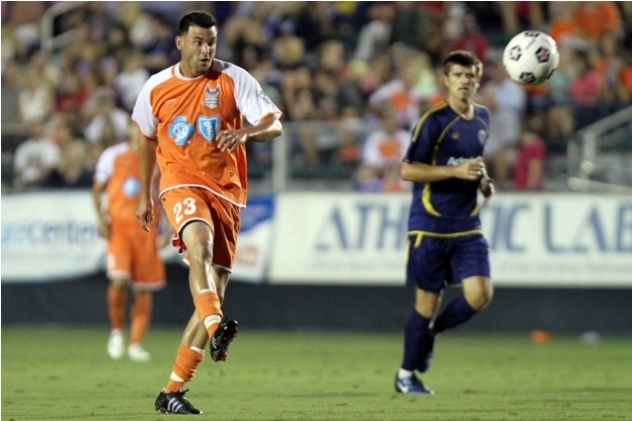 Only landing in Carolina with two weeks to go before the season started, Zimmerman knew that Martin Rennie and the RailHawks were taking a chance on him. Referred by then goalkeeper Brad Knighton, now with the Vancouver Whitecaps of MLS, Zimmerman did his part to impress and was signed just prior to the start of the season. Zimmerman finishes his sentence with a light chuckle, but one that seemed to reflect on his more humble times. Humble times though are what has molded Zimmerman into who he is now. That player who comes to work ready to put in the effort and smile while he does it. Special is an understatement. In two years with Carolina, he’s become one of the most important players on the roster. Oddly though, he’s done it without attracting the spotlight. His 2011 stats only serve to emphasize his importance. In the regular season Nick amassed 24 starts and 28 appearances with 2,022 minutes played. Five goals and one assist may seem light compared to this year, but to be playing behind Etienne Barbara (now with Vancouver) and Pablo Compos, who each took scoring honors in 2011 reminds us that when able he can be a two way player. Growing up and playing in youth soccer, Zimmerman’s position alternated between center or wide midfielder. In his recent professional years, Zimmerman has been deployed on the wings for Carolina. However his versatility has been acknowledged and utilized by former head coach Martin Rennie, now with the Vancouver Whitecaps, and current head coach Colin Clarke. Under Clarke in 2012, Nick Zimmerman has been a reformed player and arguably a new man in many ways. When asked what Clarke was doing to get such a performance out of Zimmerman, he deflected credit right back to his player. While those words might seem like rhetoric at first, it's easy to hear the sincerity in his voice. Nick Zimmerman believes in his teammates and the plan put forth by coach Colin Clarke. The natural question when any player around the world performs at a high level for a second division, is “When will this player move up?” In the case of Zimmerman, he’s been there twice, both instances ending in disappointment. But there is plenty of evidence that some players need the time, the minutes and the games to refine their game. The aforementioned Paladini being a prime example of this. When presented with the possibility of losing his star player to MLS or another high level team, Colin Clarke was positive and almost hopeful for Zimmerman. In the three matches against MLS competition this year, Zimmerman has shined. It comes down to two very simple reasons for Zimmerman’s success: joy and desire. Nick Zimmerman is working harder, putting in longer hours, extra effort and evaluating his game. More importantly though, Nick is finding joy in the game of soccer. 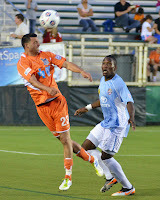 Longtime Carolina RailHawks captain, Kapono Low recognizes his teammates renewed effort in 2012. And where is this renewed sense of love for the game coming from? Was it ever gone? Those questions are perhaps something only Nick Zimmerman knows himself, but if ever there was evidence of his joy, I found it not in his comments about scoring goals or even winning. It was when Nick told me of his off field activities that I realized what a special player he was. Zimmerman devotes his spare time to coaching a local youth team. The U-11 Triangle Futbol Club team he coaches seems to be a source of real drive. Just talking about coaching and his players seemed to breathe new life into him. “They come to the games, they look at me and make fun of me haha! ‘Hey coach why’d you do this when you tell us to do that!’ They’re great. After the game the smile on their face when they want me to sign something or tell me they can’t wait to see me at practice." "It’s something that will stay with me forever," says Zimmerman. Coaching or perhaps helping to manage a team via the front office is something Zimmerman is actively pursuing as a means to stay in the game once his playing days are over. His degree comes in the form of Sports Management with a minor in business. He is working towards his ‘B’ License with plans to get move higher. Nick speaks of coaching a college team, one day a professional one and he does so with a serious demeanor, underscored by a love for the game. It is the opinion of this writer that the quality, attitude and work ethic of a player like Nick Zimmerman mean more to a team than any statistic. That he has scored so many goals this year is a testament to his finishing. That his teammates, coach, team president and youth players speak so highly of him is a testament to his character. Whether the future leads him to Major League Soccer or he stays in Carolina is still up in the air. Bottom line, through all the ups and downs of his career, it is clear that Nick Zimmerman is a true professional. One any team would be proud to have on their roster.